Banking operations amounting to Rs 500 crore in the tricity were stalled because of strike by employees of nationalised banks.The strike has led to stalling of banking transactions for three days. Dr Ajit Grover, owner of Lovely Nursing Home in Burail, and his wife Kamlesh Kaur were sentenced today to 10-year imprisonment by additional district and sessions judge, R.S. Attri. The two were imprisoned for carrying out an abortion without the consent of a women. Can the owner be booked for the theft of his vehicle? Well, this was what the Punjab Police did in case of one Naveen Kumar Jain. There is light at the end of the tunnel for baldies. Hair transplant may be the answer to alopecia(hair loss) which seems to have assumed alarming proportions in the country. However, the hair come at a price with the treatment cost varying between Rs 50,000-Rs70,000. The police busted a “cricket satta” group being run at a city hotel today. Three persons were arrested and cash, mobile and recorder sets seized from the accused. The anti-encroachment wing of Haryana Urban Development Authority (HUDA) demolished around 1,000 jhuggis and cleared around 8 acres in Sector 5 B, Mansa Devi Complex, here today. A candle march was organised by various Sikh organisations under the leadership of SGPC member Hardeep Singh here this evening against a ban on turban in France. Panchkula : The district administration will award 28 persons for their meritorious services on the 59th Republic Day celebrations to be held at Parade Ground here tomorrow. On the eve of the Republic Day celebrations, no one in Mohali knows who are the persons being awarded by the minister for cooperation, Capt Kanwaljit Singh, at the celebrations tomorrow. Urvi Manocha (9), a student of Manav Mangal School, Sector 21, Chandigarh, has been selected for the National Bal Shree Award-2007 in the field of creative performance. 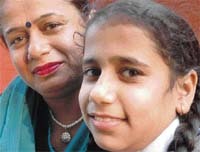 The youngest among the other 50 other national awardees, Urvi will receive this award from the President of India. The Air Force has decorated the two-man crew of its around-the-world microlite expedition with the Shaurya Chakra. The expedition flew 40,529 km, landed at 85 destinations in 19 countries and created a new world record of circumnavigating the globe in 80 days, bettering the previous world record of 99 days. Chandigarh, January 25 Severe cold hit life in the city which wore a deserted look as the day temperature dipped to a record 14.4 degrees, making it the coldest day of winter so far. There was a slight improvement in the night temperature which rose to 3.4 degree against zero yesterday. People were forced to stay indoors as the day temperature fell by a significant 3.4 degrees against yesterday when it was 17.6 degrees. Art historian B.N. Goswami has been chosen for the second highest civilian honour of the country. He is among the 35 Padma Bhushan awardees whose names were announced today. Revered in the field of art for his extensive research work and pedagogy, Goswami was in 1998 presented with the Padmashri. Speaking to The Tribune from Chennai tonight, he said the award was more a recognition for the fascinating world of art than him. Neurologist and professor emeritus of the PGI, Dr J.S. Chopra, has won Padma Bhushan. It was a pleasant surprise for Dr Chopra when he received a telephone call from the ministry of home affairs to get his “consent” for the award last night. “The credit for the award goes to my wife who was instrumental in forwarding my biodata to the Punjab Government and the Chandigarh administration,” he told The Tribune tonight. DIG Vivek Gogia and inspector B.S. Negi have been awarded President’s police medal on the eve of Republic Day. UT cadre IPS officer Vivek Gogia is currently in charge of the police headquarters, intelligence and vigilance cell. Pritpal Singh, inspector-general north-west zone of the ITBP, Chandigarh, who was awarded police medal on the eve of Republic Day. The MC has decided to honour families of martyrs of the city, who sacrificed their lives while defending the Indian borders, during the Republic Day celebrations. Those who will be honoured are father of 2-Lt Rajiv Sandhu, MVC (posthumous), father of Capt Rohit Kaushal, SM (posthumous), mother of Capt Atul Sharma, father of 2-Lt Anil Yadav, SM (posthumous), wife of Brig B.S. Shergill, wife of Major I.S. Babbar, Kirti Chakra (posthumous), wife of Major Mohit Vij and wife of Major Vivek Bhandral. The CHB today held a meeting with residents of Sector 42 and gave them an ultimatum to remove encroachments. “Srishti”, the Environment Society of Government College for Girls, Sector 42, Chandigarh, in collaboration with the Punjab State Council of Science and Technology under the national environment awareness campaign (NEAC 2007-08) and biological association of the college, organised a street play competition on biodiversity conservation on the college premises today. 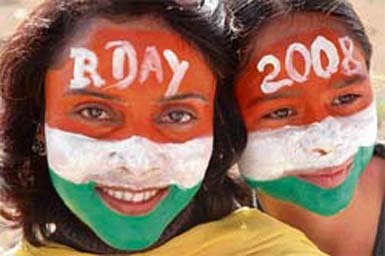 Students of St Soldier’s International Convent School, Phase 7, celebrated the 59th Republic Day with patriotic fervour, here today. The special assembly began with the patriotic son ‘Vande Matram’, sung by enthusiastic children of the primary section. 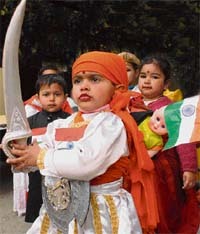 This was followed by tiny-tots of the school briefing the audience about significance of Republic day. The District Consumer Disputes Redressal Forum-I has directed Bajaj Allianz Life Insurance Company Limited to pay a compensation of Rs 25,000 to Dharam Pal Verma, a resident of Tarn Taran. Employees from State Bank of Patiala, State Bank of India and Union Bank of India assembled before the main branch of the State Bank of India and demonstrated against the anti- employees’ policies of the Central government, here today. Ram Gopal, an undertrial lodged in the Central Jail here, escaped from police custody today while he was being brought to the district court complex. A unique ‘concept car’ developed by students of Shaheed Udham Singh College of Engineering and Technology stole the limelight on the final day of the International conference on recent developments in mechanical engineering that concluded here today. The wonder car was developed by a team of students led by Dr B Lonia. Harjinder Singh Kang and Pauline J.M. Singh clinched themen's and women's titles in the Tata Safari Chandigarh Golf Championship that concluded on the par-72 greens of the Chandigarh Golf Club, here today. 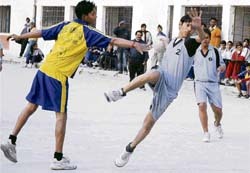 Coaching Centre Government Model Senior Secondary School, (CCGMSSS), Sector 19, registered a 16-14 win over Government High School-26 in boys’ section in the 21st Junior Chandigarh State Handball Championship being held at DAV Senior Secondary School, Sector 8, here today. The Chandigarh Administration, which denied the Indian Cricket League (ICL) to provide Sector 16 Cricket Stadium for their inaugural edition, is ready to be part of the forthcoming BCCI’s Indian Premier League (IPL). Chandigarh Twenty20 Cricket Association announced the list of probables for the coaching camp for upcoming u-19 nationals to be held in Hyderabad under the aegis of ATC-India. Pemphigus (blisters), a potentially life-threatening skin disease eluding treatment for a long time the world over, has finally met its match at the prestigious All-India Institute of Medical Sciences (AIIMS), New Delhi. A team of Dr Sushruta Dash and Dr Komal Aggarwal from AIIMS, New Delhi, won the IADVL-GSK national quiz programme for postgraduates (IGNQPP) on the second day of Dermacon-2008 being held at the PGI here today. Burglars broke into Raghunath temple here last night. The police said they decamped with four ‘chhatars’ and some other ornaments made of silver, weighing around six kilograms. The 16 close-circuit cameras installed at the temple proved of little use as lights were switched off during the night.